For a cold and precipitous day this past weekend, one layer of leather wasn't quite going to cut it. Two layers of leather, however, are a lot warmer than you might think. And mixing every neutral shade together in one outfit is probably one of my favorite things ever. Mike & Chris leather jacket (similar), June leather vest (similar), Bailey 44 top (similar), Nordstrom scarf (similar), J. Crew pixie pant, Tory Burch flats, Louis Vuitton bag. I'm off to Minneapolis today! I really should be packing. You look fabulous as always! Great Outfit! Your jacket is totally cool, I love the color! that's one of my favorite things about winter.. layering! cool look. have fun in minneapolis.. and thanks for your comment on my sketches.. I appreciate it! Layering is one of my favorite things too :) You're welcome! I already found your blog, I like it so much so I follow you. We can follow each other, so follow me if you want. oh i love what you did with leather and leather! i must try this out definitely, so clever! i noticed it at once. you look amazing dear! I'm not crazy about the cold but super crazy about your leather jacket. ADORE. Just followed you on GFC and Bloglovin. Would love your support back! Brr - it must be cold! But at least it looks super cute!! You have mastered the layering technique it looks like! This is something I feel I need to work on. Thanks for giving us good ideas! Also thanks for stopping by on my blog. I am a new follower! awesome! we love the jackets! 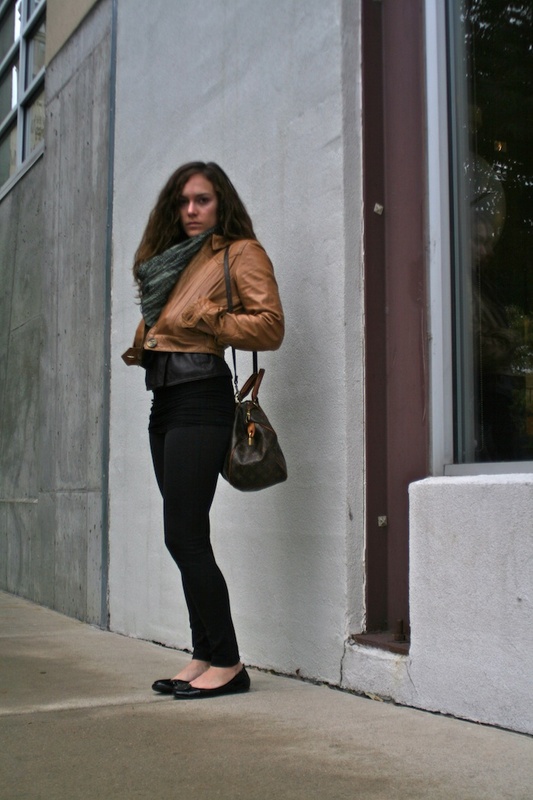 Love the idea of layering leather! Looks fabulous! your outfit is very Autumn! i just love your jacket! Love the leather jacket and I also love pairing up neutrail shades! Love your jacket! Amazing color (one of my favorite) and I love your Louis! great outfit:)lovely jacket and you look amazing!! I love this simple casual look!! Gorgeous outfit, love that jacket! Wow who would have wearing leather on leather could look so chic.